“But, while these would all be interesting topics, deep down inside me, I wanted to share with you a story, the story of Sri Lanka’s cricket, a journey that I am sure Colin would have enjoyed greatly because I don’t believe any cricket-playing nation in the world today better highlights the potential of cricket to be more than just a game.” – Kumar Sangakkara at the Colin Cowdery memorial oration. Only a few sportspeople end their on-field career on a huge launching pad, with untold possibilities. It is not like the NASA sending a rocket to outer space and to the unknown. It is a case of concluding your first phase of life on a high. Kumar Choksanada Sangakkara would bid adieu to his illustrious cricket career on the highest pinnacle, and even now the general bar-stool talk is what he would do in his after-life and who is going to pick his brains. Certainly I am sure it is not going to be dormant. Recently, I met one of his contemporaries in school, Ashan Welagedara, at a certain forum and it was he who was the wicketkeeper of Trinity when Sangakkara was catching in the slips. Sangakkara in his own words claims that he was a late developer who took the game seriously only in the post-school arena. Somehow even I do remember after being associated with sports for almost four decades, the only Sangakkara who did sports at a grand level in that era was his sister Saranga who was the local Tennis champion. This is where the crunch comes. The cricket stalwarts that we have had in this little island starting from the Sathasivams to Muralitharans shone while at school and it was only a matter of time that we would see them crossing the boundary line with the rest of the Lankan team. But, here is one man who put the hard-yard into his resolute and perfected the art of stroke-making and ended up on par with any great that you could think of – any great who was great enough to be labelled as one. There is no point in me penning their names down, you know it by heart. That NCC doyen Ranjit Fernando remembers Sangakkara’s early days at the NCC. “He was not an extra ordinary player, but, a player who was willing to work hard. I remember once I was managing the national team in Zimbabwe while the ‘A’ team was in South Africa. South African TV was broadcasting the ‘A’ series. 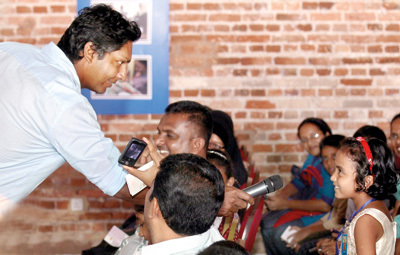 At one of the matches Kumar Sangakkara must have done well – he was seen on TV handling the man with the mike. To be very honest the whole team hierarchy who watched that TV interview were impressed. That was the first time that he was more than noticed. “Soon after that incident, the Zimbabwean national team was in Colombo and Kumar was playing for the President’s Xl. I went for that game with the then national coach, Davenell Whatmore. In that game Kumar scored a big hundred and watching him Whatmore said these are the youngsters who should be taking over the national team — and soon after Kumar made his mark,” Fernando said. Wettimuny, Sri Lanka Cricket Interim Committee Chairman also said: “Talking from a local point of view, we are a very lucky nation, for the fact that from the time I remember our cricketers have been raising the bar. Yes, there was a time that we used to think if we could make a fifty against a certain opposition in a Test match it could be an achievement. We gradually overcame that drawback and began to raise the bar gradually. However, in recent times, cricketers in the calibre of Kumar Sangakkara and Mahela Jayawardena have raised the bar to such levels that it is huge now. It is on par with the best that the world has ever produced. Yet, I wonder even if anyone were to achieve what Sangakkara has earned as a cricketer, would he be on par with that complete product. He is a rare specimen of a complete product that could be put on show in any forum in any level of world society. My personal experience with him was unforgettable. Once he attended one of our promotions that we had organised for a congregation of young kids to teach them the ‘importance of reading’. He was invited to speak for just five minutes. Yes, he did speak on the given subject – not for five but, for twenty minutes – every second related to the main topic. Yet, at the same time he kept the entire audience awed with the eloquent literacy of the speaker and deep knowledge he had on the subject and translating that into a manner that would keep the interest of the young audience. Finally, it was not just the opportunity of meeting that icon in person, but, the kids encountered a man who taught them the importance of reading. There are some other unpublicised stories too. The story of him working with the Murali foundation and the work load that he and the others have accomplished in the Northern parts of Sri Lanka have nothing to do with the game of cricket, but they show another side of him that is as good as his stylish cover-drive. Yet, the deft late cut came, when he played god to the Kiribathkumbura fruit vendor when the latter was under the impression that the whole world including the deities had turned against him. But, because of Sanga’s philanthropy, the man who was suffering from the deadly Dengue fever saw the light of another day, and the will to take a stroll in the market-yard. Yet to be human one has to possess the flip side of the coin, too. Yes, there were times that his former team mates engaged in unsavoury banter, while some administrators almost openly found fault with him and his closest buddy Mahela Jayawardena for not falling in line. Yet, this goes a long way to show that this man is a complete product that would rarely trek our boardwalk. There is also a certain school of thought who is of the view that Aravinda de Silva was the best that Sri Lanka has ever produced. Yet there is also a huge forum that feels Kumar has the credentials to wear that crown. But, in their own ways they both are champions. They both have one achievement that no one could have achieved. In 1996, it was Aravinda’s century that took Sri Lanka to the glory of winning the World Cup. Then in 2014 it was Sangakkara’s 35-ball 52 that took Sri Lanka to its second world title. A bar that would only be bettered or broken by a future generation cricketer if there is one. A week hence the left-handed elegance of ‘Sanga’ would become history, and then, his story will live among us forever.